Every summer, the local media publish their annual stories on the best ice cream, beaches, and fried clams in New England. Pilgrimages are made to Ipswich and Essex, and the merits of their clam shacks hotly debated. While I eat and enjoy clams, you’ll notice my artery-threatening seafood of choice is shrimp. 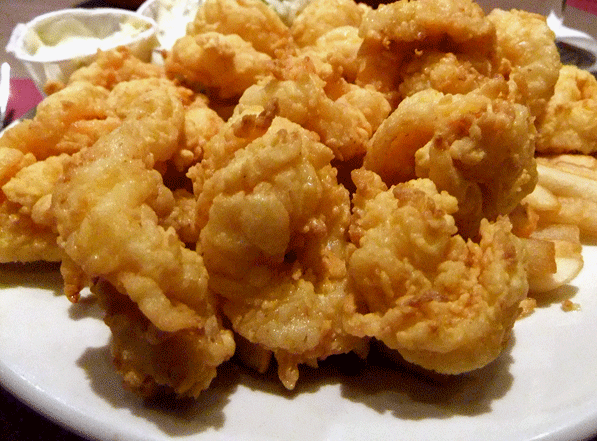 And the best fried shrimp on the North Shore is found at Dube’s Seafood in Salem, hands down. The Pelletier family has run Dube’s (pronounced Doobies) since 1961, when they bought what at one time was a take-out stand from the original Dube. The interior décor likely hasn’t changed much in the past half-century. We’re talking old school here; red vinyl banquettes, laminate tables, wood-paneled walls, and a long low bar. It’s tiny and dive-y but quite comfortable, and the staff is terrifically friendly. Clichéd as it sounds, for me, Dube’s isn’t just a restaurant; it’s a family tradition. My dad inevitably sees someone he knows there. Whenever one of my siblings comes back to the area to visit, a dinner there is imperative. 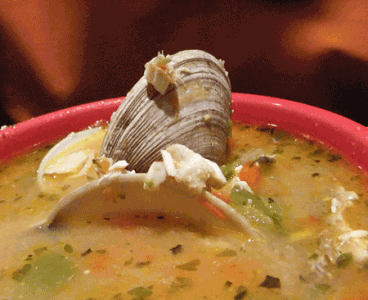 Whenever a new seafood place opens, Dube’s is the standard to which they are compared. When we stopped in for dinner last weekend, I realized that I’ve been eating there for something like 30 years. And I have to admit, I always order the same thing—the fried shrimp. Dube’s menu offers weekly specials in addition to a wide variety of baked, grilled, and fried fish, but somehow when the waitress appears with her pen poised, it’s gotta be the shrimp. We ordered cocktails, which are incredibly well priced. 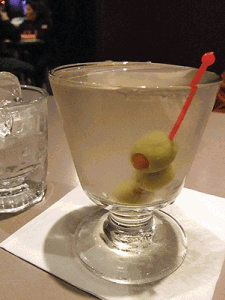 They run the gamut from old standards like my dirty martini ($5.25) to newer, seasonal creations like the pumpkin martini on offer that night ($6). The obligatory starter is always the famed onion rings ($6 for small, $8 for large), which are medium cut and not too heavily breaded. Then the hot, succulent, golden entree plate arrives stacked high. I counted 17 shrimp piled on the mound of fries ($14.95). The coating is light and crisp, and the seafood moist and incredibly fresh tasting. Not having grown up with a fried shrimp obsession, my partner in crime debates his choice of entrée each visit. This time, he decided on a fish stew special. It was an impressive bowl, full of shrimp, scallops, haddock, and clams in a rich, satisfying broth, served with rice and fresh-cut veggies on the side ($10.95). Far enough from the center of town in a mostly residential neighborhood, our waitress tells us that Dube’s doesn’t get the huge influx of tourists around Halloween that most of Salem does. “Unless they ask a local where to go for seafood, then they come here.” And that about sums it up. Locals in the know will tell you Dube’s is the place to go for the best fried seafood around. Editor’s Note 2/2/11: J Quick Kitchen has changed it’s name to Black Cow Express, but currently maintains the same menu. Locals were all abuzz when the old KFC building on the Salem side of Vinnin Square started to undergo renovation this summer. The arches on the exterior had some believing that it was going to become a Taco Bell, but the truth was revealed when signs arrived declaring J Quick Kitchen, sandwiches and seafood. This entry into the fast casual arena was created by the owners of the Black Cow restaurants, and it opened this week. We visited them twice and both times were impressed at how well they lived up to their name. Quick indeed: on the first visit, our food was served in five minutes, and on the return visit, a much larger order to go was handed over in six minutes. Everything was nicely packed and labeled, complete with sauces and plastic-ware—amazing. 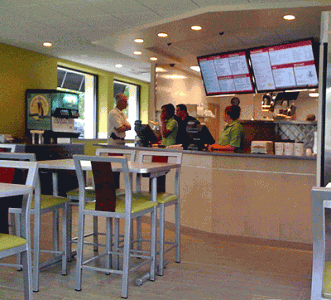 The interior is bright, clean, and pleasant with funky lime green accents and large digital displays for menu boards. The abundant staff was perky and welcoming. The menu features all the standard sandwich shop usual suspects, including a turkey club, a reuben, and burgers, along with fried seafood offerings. It’s clear, however, that J Quick Kitchen strives to offer quality beyond the local sub shop. They roast and carve their own meats, smoke their own pulled pork, and freshly prepare hand-cut french fries. Our favorites were the J’s Chicken sandwich ($7.50) which featured a grilled chicken breast, hickory bacon, cheddar cheese, and BBQ mayo on a toasted kaiser roll, and the shrimp plate, which was super fresh, sparingly breaded, and a bargain compared to many local places at $12. We also liked the fries, which were thin and crispy. The coleslaw was a bit too soupy. Another great taste was the house-smoked pulled pork sandwich ($7.50) with North Carolina BBQ sauce. It was unexpectedly savory and smoky and not swimming in sauce. The pressed rueben ($8) was tasty though a bit soggy, and the crispy haddock plate ($11.50) was respectable. The sandwiches are not huge, but they’re filling, and the seafood portions are generous. Although there are a couple of standard vegetarian options on the menu, a few more creative healthy choices would go a long way to woo those of us who love the fresh approach and convenience but hate the calories involved with most take out. 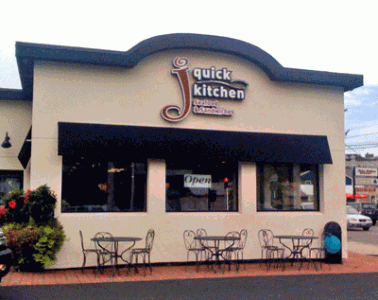 In an area already chock-full of chain restaurants and fast food, it looks like J Quick Kitchen is using service and quality to set it apart from the pack. We truly were pleasantly surprised by the experience, and while they may still be gauging their customer base, J Quick Kitchen is a fascinating addition to the square. When I visited Ben Rhodes and Rafe Hershfield back in May to find out about their new venture, Hooked Seafood and Grill, they explained their theory for the new eatery. Similar to the fast-casual concept that’s all the rage, Hooked is a combination of restaurant and take-out, where the quality is better than fast food and less expensive than a sit-down restaurant. Like a standard clam shack, diners order at a counter and bus their own tables, but the meals are served on china by waitstaff, and beer and wine is available. This Sunday it was too hot to cook, so we headed over to test the theory and the food. Apparently we weren’t the only ones with that idea. The restaurant, which opened last weekend, was packed. All the tables were filled, and people were waiting in line for takeout. Luckily, we were able to snag a spot after a minute or two. The space has been totally renovated and looks terrific, especially if you remember the erstwhile Super Sub. Hooked’s menu offers quite bit to choose from, including both grilled and fried seafood entrees. We placed our order at the counter, paid, and were given a number, and when our food was up, a waitress brought it to the table. The daily special, a Long Island striped bass roasted with lemon and herbs, was terrific—moist and delicious ($11). The fried haddock plate offered quite a generous portion of both fish and onion rings that tasted fresh and weren’t greasy ($11). The grilled swordfish kabob was tasty, if a bit overcooked ($10); the breading on the fried shrimp was just a tad heavier than I generally like, but shrimp were large and flavorful ($15). The junior member of our party ordered a cheeseburger from the 1st Mate menu ($4.50 with a drink and fries), which received a double thumbs up. Of the sides we ordered, the onion rings were the best; savory, thin and crunchy. The cole slaw tasted freshly made and although a bit heavy on the mayo had a nice zing from caraway seeds. The fries seemed to be lightly coated, but were tasty and crisp and disappeared from the table in a flash. It’s clear Hooked is still refining it’s work flow, but it’s early days, and the staff were all friendly and helpful, so no doubt they’ll find their groove. The take-out business seemed to be booming, and in the small space customers waiting for their orders blocked the door and counter area. We found ourselves wondering if they could install a take-out window on the driveway side to alleviate the congestion. We plan to return once the crowds abate a bit and look forward to trying their rendition of two of the most hotly debated summer foods on the North Shore: lobster rolls and fried clams.